Bengali Fish Fry is nothing like the ordinary Fish Steaks fried in mustard oil, this is Fish Fillets, marinated with spices, dipped into a thick batter, coated with bread crumbs and deep fried. Usually this famous evening time Snack is brought from the snacks shop, when guests visit our house. But nowdays everything is available in the local market, so we do not have to depend on the Snack shop for this "Fish Fry". We can make it our own. Kolkata is very much famous for their street food. There are lots of street food like Egg Roll, Chicken Roll, Chicken Cutlet, Chow Mein, Moghlai Paratha and Bengali Crispy Fish Fry. But it is healthy to have the homemade street foods. This way you can enjoy all the tastes but you will be still with healthy stomach. 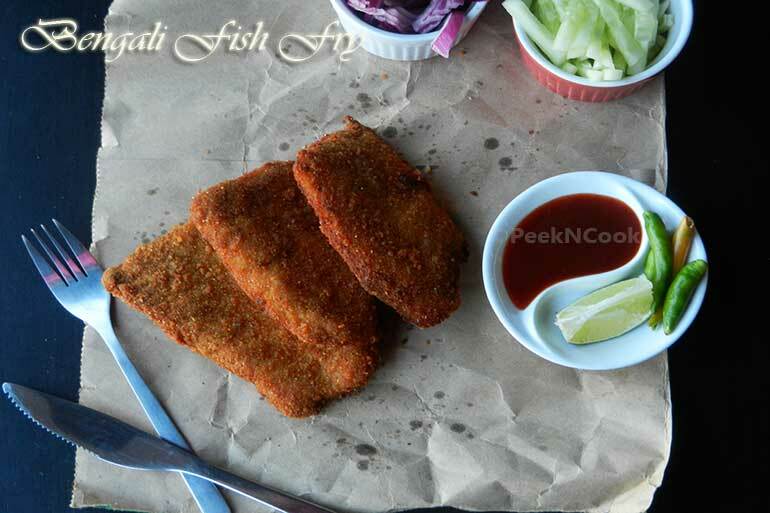 Here is the recipe of Crispy Bengali Fish Fry. Take two fillets and cut them in 4 equal size. Now take the thick piece and slice it into 2 fillets. Take all the fillets in a bowl and squeeze the lemon juice on them and sprinkle some salt and leave for 1 hour. Now take a bowl and add onion juice, ginger garlic paste, cilantro & green chili paste, garam masala powder and mix them. Take the mixture and pour over the fish fillets . Make sure all the fillets are covered with the mixture. Leave them for 6-8 hours or overnight. Now make a batter with egg, corn flour and some water. In another plate put the bread crumb. Now take each fillets and dip into the egg & corn flour batter and then place on the bread crumb and coat the fillet all over with the bread crumb. In this same process make rest of the fillets, place them in a plastic container and keep refrigerated for 4 hours. Heat enough oil in a deep pan . Remove from refrigerator and deep fry the Fish Fries and serve hot with some sprinkled Black salt over the Fries and serve with Ketchup and salad.